How to get iTunes media on Google Pixelbook? The Google Pixelbook is the first Chromebook worthy of consideration alongside the most high-end Windows and Mac devices. From its excellent design to its massive software enhancements, this is the best Chromebook to date, bar none. How can we get iTunes media files on Google Pixelbook? This post will give you a clear solution. Let you enjoy iTunes movies and music on your Pixelbook without any restrictions. Can we install iTunes onto Google Pixelbook? 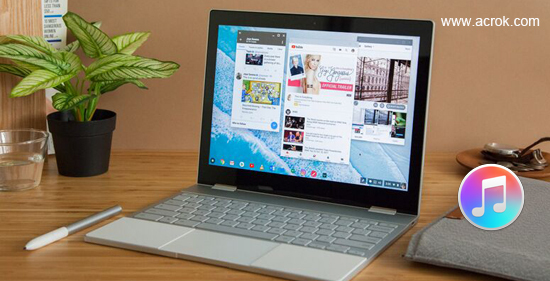 Google Pixelbook is a popular choice for many due in part to it's lightweight designs and easy-to-navigate interface. Where they occasionally fall short, however, is allowing you to run software that you may have become accustomed to on your Mac or Windows PC. One such application is iTunes, which allows you to manage all of your music across multiple devices. Unfortunately, there is not a version of iTunes compatible with Chrome OS. So we can't install iTunes onto Google Pixelbook. If you still want to play iTunes movies and music on Pixelbook, just keep reading. Not: If your Google Pixelbook can't read and play your iTunes music, you need to convert then to .mp3 via Acrok free iTunes music converter (Windows | Mac). How to play iTunes movies on Google Pixelbook? It must be a great experience to enjoy iTunes movies with it. But as we all know, unlike the DRM-free iTunes music, iTunes movies are still DRM-protected, thus they can’t be played on non-Apple devices. Is there any way to break it though? Congratulations! You've got a big yes here. This tutorial will guide you the easiest and fastest way to play iTunes movies on Google Pixelbook with the most powerful DRM removal tool - M4VGO (Windows | Mac). 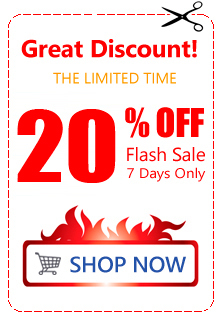 Tip: You can get powerful DRM removal tool via 25% Off Coupon Code now. How to convert iTunes movies for Google Pixelbook? The below guide uses M4VGO for Windows (Windows 10 compatible) version screenshots. The way to finish the task on Mac is the same. Just make sure you download the right version according to your operating system. Launch this iTunes to Google Pixelbook converter on your computer, Click "Add files" button on the upper left of the interface to add iTunes purchased or rented movies you need to convert. Click "Format" option and here we recommend you to choose Common Video -> H.264 MP4 Video (*.mp4), this format is well supported by any Chrome OS devices. If you convert iTunes music for Pixelbook, please choose MP3 format as output format. Click "Convert" button to start removing the DRM protection and converting iTunes movies to normal MP4 video file for Pixelbook. When the conversion is done. Click "Open" button to locate the converted iTunes media files. You can transfer these files to Google Pixelbook for playing now. Tip: If you want to play Blu-ray and DVD movies on Google Pixelbook , Acrok Video Converter Ultimate can give you a hand. 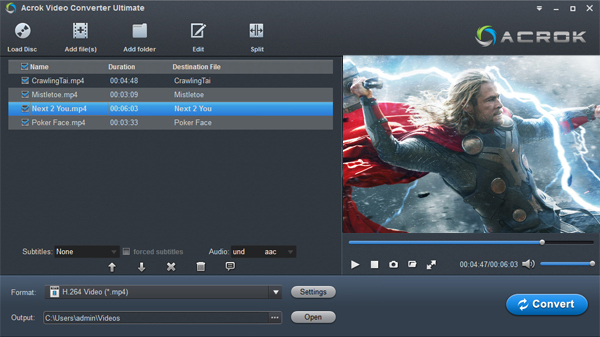 This software is the best Blu-ray/DVD ripping progroam which can convert Blu-ray and DVD disc to any video/audio format for playing on any devices. In addition, you can convert your downoaded movies, footage, MV for playing, editing and sharing. I really appreciate your DRM removal making it possible to use music I pay for on all my electronic devices. 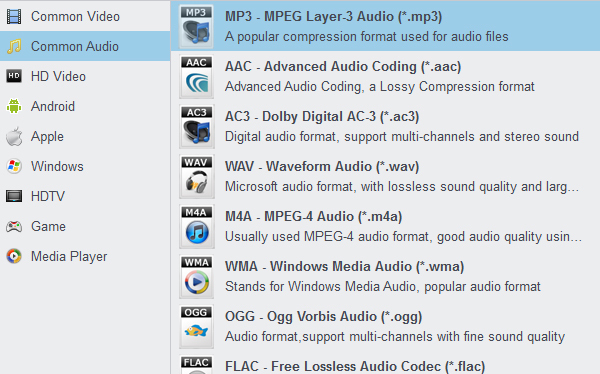 It is not only supporting may formats for video/audio even we can convert copyright protected video and audio files.